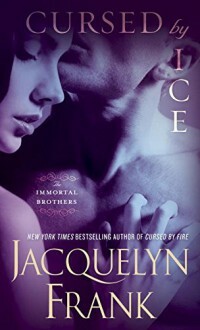 From New York Times bestselling author Jacquelyn Frank comes the smoothly sensual second book in an exciting new series featuring four immortal warrior brothers who must stake their hearts against their fate. As punishment for plotting with his brothers to steal immortality, Garreth is suffering a freezing torment until the end of time. Again and again, his fierce fighter’s physique is frozen into a chiseled ice sculpture, his heart hardening like a diamond in his chest—only to thaw and resume the chilling torture. Until, like his older brother Dethan, he is offered a reprieve from a goddess—in exchange for his allegiance in a celestial civil war. Garreth lives to fight and fights to live. But while laying siege to an embattled city, he finds another reason to go on—a beautiful warrior woman named Sarielle, who commands a mythic beast through a mysterious and powerful bond. Terrified of her strength, the city rulers have kept her captive, and now she refuses to submit to a new master. As Garreth seeks to unleash her passion and melt the icy resistance of her heart, will he become her ultimate salvation—or lead them both to greater destruction?